Velomobiles are old tradition in Finland. 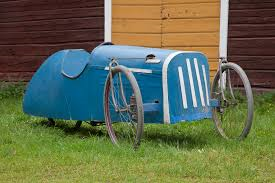 After the WW2, when there was serious shortage of gasoline, cars and rubber, people started to build velomobiles from plywood and old bicycle parts. This is the tradition, that Velogatti is part of, taking it to the next century with some modern E-technology added. 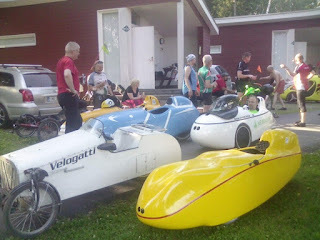 After the WW2 in Finland there was even international velomobile races in Helsinki capital. When one observes old photographs from those races one truly admires the workmanship and lines some of those old velomobiles. 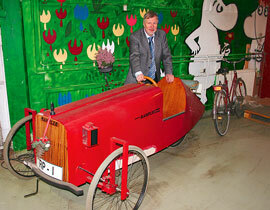 Another idea to build Velogatti came from the Finnish magazine Mobilisti, which is dedicated to museum cars mainly. One of their 2013 issues has a cover story of one of these old velomobiles. And a testride. Velogatti name came from the idea, that if there"s Veloschmitt, why not Velogatti then? It sounds good. Last motive to build Velogatti was my RC-background, i have been building giant scale model airplanes a decade, competeting with them on national race level, and construction of a traditional velomobile did not seem too complicated for a starters. Traditional style velomobile is also hell of a lot cheaper than it"s modern carbon fibre sibbling. 1/6 of a price. With modern E-technology it can still be relatively fast. One this kind of velomobile requires approx same amount of working hours than building a giant scale RC model aircraft, around 200-300 hours all included. I have build many. Velogatti"s frame is a hybrid with 12 meters of aluminium and wood combined stressed skin style used on aircraft wings, where plenty of that massive downforce is directed to the wing"s lower surface, where it turns to a stretching force. Metal bends easily, but it does not stretch. One of the key aircraft design principles is to turn all bending forces ninety degrees to a stretching forces. It"s not the bulk of the bar that carries the load, it"s the surface of the bar that takes the load when the bar is bending. Chassis is a simple 4mm plywood construction. Front end is pretty much a copy of those old velomobiles. It looks quite archaic, but it serves the purpose well enough. That front grill "brand" is just one off brainstorm. I recently read a story complaining that modern car"s front grills look too angry and hostile, i do agree, so i thought that why not make it bit more happier? :) I grew up during the seventies seeing Skodas and Trabants and like. Friendly-looking cars. These modern angry Audis and whathaveyou just look so silly to me. There are no drawings or plans of Velogatti, but i guess if somebody might be interested i can mail some basic measurements. People seem to like it a lot, which of course is flattering. It is a nice ride really. Nice story and beautiful car. 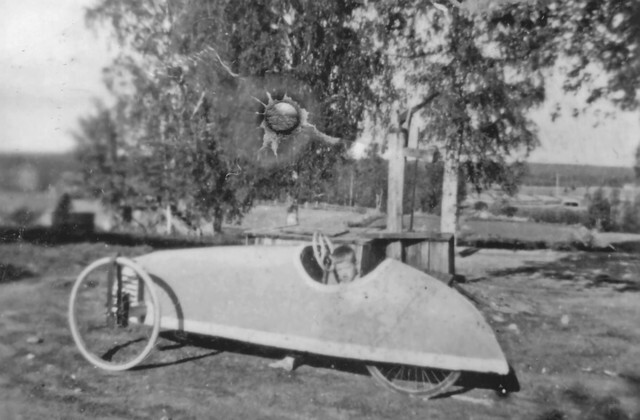 An oldskool oneseater velomobile would be a great winter project. I would use cheap 4mm Meranti plywood. It passes the bending test, needed to form the front hood. Go for it! Front hood is 1,5mm plastic from Suomen Plastic OY. You will need around 8-10 squaremeters of plywood for the sides and rear. I used Erikeeper Plus as a glue. Front grill is very thin aluminium foil glued to plywood. Aluminium frame is glued and nailed to wood. I'm still in progress with my current 2seater project. Hope to be ready in 2 months. After that a one-seater would be great fun and hopefully much faster to build.